I’ve been thinking about making this post for a while now, and I thought that as a lot of people must be doing Veganuary this month, now would be the perfect time! When I started my vegan experiment in the beginning of last year, I felt a bit lost. I didn’t exactly know what I could eat, and more annoyingly, where would be “safe” for me to eat out. Luckily I very quickly learned that it’s always best to just ask for help – from friends, from the lovely people of the internet and from amazingly patient waiters. If anyone else is feeling a bit like I did last year, I hope this small guide will help, at least a little bit. I know it can be difficult to find a suitable restaurant to eat in, especially when going out with a bigger group of people, all with different eating habits. Chain restaurant can sometimes feel soulless, but they are a great place for a varied mix of options for all sorts of people. You also generally know what to expect, which can be a good thing when you’re just trying this vegan thing out. I’m also doing this list as a little reminder for myself, too. I’m not fully vegan, but I’ve been happy with my 80/20 approach to eating animal products. Lately, though, I’ve been slipping a little bit, and I’m just trying to get back to the swing of things. My aim is to try and be vegan most of the week, but then allow myself a vegetarian meal (if I want one, that is!) once a week or so. We’ll see how it goes – wish me luck! Let’s start with my long time favourite! I always knew that Wahaca was really good for vegetarians (even when I was a meat eater I would often still go for the veggie options, they’re that good!) but whilst I was doing Veganuary last year I also learned that they have secret-but-not-so-secret vegan options too. These options, a vegan burrito and vegan tacos, are not actually on the menu, but if you ask your waiter they will know what you’re talking about! I don’t know why, after a year, they’re still not printed on the menu, but I’m glad that at least I’m in the know – and now you are too! I’ve actually never tried the vegan tacos (I need to do that next time!) but I can absolutely vouch for the vegan burrito. I go for it every time (and I go to Wahaca a lot…) and I’m still not even close to getting bored. It goes best with Wahaca’s dark chilli sauce (beware of the yellow sauce though – it has honey so is not 100% vegan) and with some tortilla chips and salsa – yum! The burrito actually comes with a few tortilla chips of its own too and only sets you back £7 – such a bargain! The spaghetti was really tasty too, and like in the pizza, you could add different toppings of your choice to it – I went with chilli (of course) and some really lovely fried peppers. We also tried the vegan bruschetta from the starters – I’m a big fan of this Italian treat and luckily Zizzi’s version didn’t disappoint either! Unfortunately we were so full from our mains that we didn’t have a chance to try their vegan dessert, which is quite the shame as a sweet calzone filled with lovely berries and pecans sounds pretty amazing. Luckily there’s always a next time! I wasn’t quite sure if I was going to include this chain, as I have to say that I was pretty disappointed in both of my dishes. I decided to keep them on the list in the end as I’ve had two very different experiences in two different branches of All Bar One – one being really wonderful and the other, well, not so much. I had the vegan miso bowl on both occasions and in the Regent Street branch (see picture here) it was really tasty with lots of sauce, lovely rice and plenty of beautiful veggies. The same dish in the Tottenham Court Road branch however was completely different – you can even see it by comparing the two pictures! There was barely any sauce, the rice was so sticky that you almost had to cut it with a knife (okay, I exaggerate slightly) and it seemed a lot smaller as well. I would give All Bar One another chance though as right now my experiences are 50/50 – it could be that my recent bad experience was just bad luck. The chain has a vegan set menu for the remainder of Veganuary, but most of those products are already part of their regular menu too. All vegan dishes are very clearly marked as well which I have to give them points for. Wagamama has a few different dishes in their menu that are already vegan, but on top of that they also have some lovely recipes that can be made vegan by removing just a few things. Luckily for me, my absolute favourite dish, the firecracker curry, can be made vegan – yay! It’s originally a chicken curry, but you can ask it without chicken and just with more vegetables. It’s SO good! Also, very spicy – just a disclaimer…. Another one of my favourites is a lovely, spicy, green coconut & lemongrass soup called Yasai Itame. It’s so creamy, full of flavour and lovely vegetables, and I think it would be absolutely perfect for those cold, rainy days we’ve had so much recently. I’ve also been advised that a lot of their dishes can be made vegan by just substituting soba noodles (which I imagine contain egg) to either rice, rice noodles or udon noodles. I’ll probably try that next! 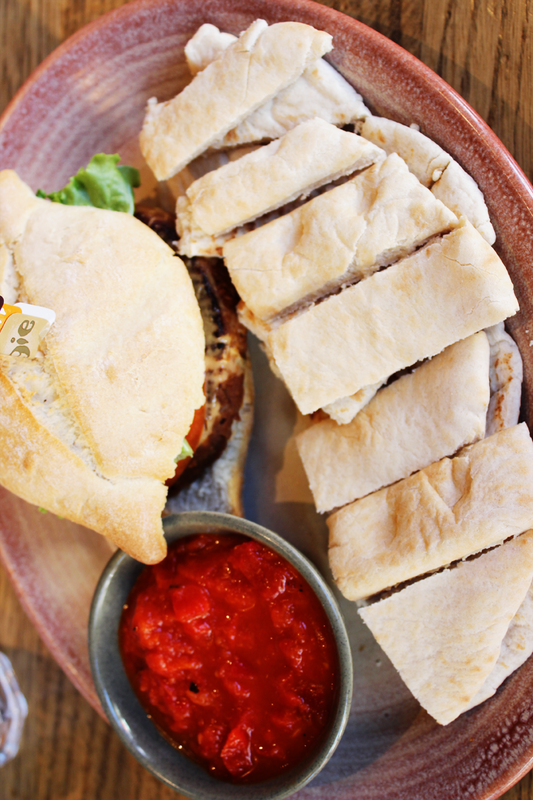 As a chicken restaurant, you’d imagine Nando’s wouldn’t be very good for vegetarians, let alone vegans. How wrong would you be! They have three lovely veggie mains, one of which (aptly named the Veggie) can very easily be made vegan by swapping the mayo or yogurt sauce to something else, such as sweet chilli sauce or just more of Nando’s own marinade. You can have this as either in wrap form, in a burger or as a pitta, all of which are slightly different from each other. I’ve tried all of them and I think my favourite is the burger – it’s so yummy! There’s also lots of sides you could be having, from the divine peri peri chips and garlic bread to the green salad for something a bit healthier. They also have great starters, from which my new favourite is the pitta strips with the peri peri houmos. The mix of the spicy nuts are also a great way to start your meal – beware though, as they are very moreish!